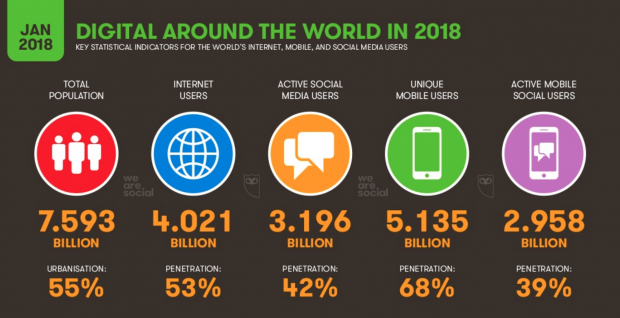 On average, people around the world spend two hours and 15 minutes every day on social media, which is one out of every three minutes spent online. Fifty percent of Gen Z (18- and 19-year-olds) and 42 percent of millennials (20- to 36-year-olds) think social media is the most relevant channel for ads, according to Adobe’s State of Digital Advertising 2018 report. Meanwhile, everyone over the age of 37 thinks TV ads are more relevant, but they still rank social media second. Fifty-seven percent of millennials and 45 percent of Gen Z—the demographics most likely to be on social media—agree that the ads they see are getting more relevant. 200 million users visit at least one business profile page every day; and two-thirds of those visits are from people who don’t follow said profiles (yet!). According to Instagram, there’s been an 80 percent increase in time spent watching video from 2016 to 2017. So it makes sense that 62 percent of marketers are planning to increase their social video spend in 2018. Even more telling: 60 percent of Instagram Stories video ads were viewed with the sound on in 2017. Compare that to Facebook’s seven percent (more on that below). Instagram wants their Stories ads to be as robust as their feed ads, so new features are added all the time—like scheduling or Carousel ads. The former has historically driven 30 to 50 percent lower cost-per-conversion and 20 to 30 percent lower cost-per-click than single-image link ads). More than 150 million users have a conversation with businesses through Instagram Direct each month. One third of those messages start with an Instagram Story. This lines up with Instagram’s stated goal of increasing conversion naturally, using messaging and improved calls-to-action. The Facebook algorithm is undergoing big changes in 2018. Everyone’s wondering what, exactly, that’s going to mean for Facebook’s 6 million advertisers. With 2.2 billion monthly active users, (up 15 percent since 2017) advertisers can rest assured that Facebook is still the world’s social media heavyweight. By the end of 2017, Facebook advertisers increased their spending 49 percent, to just shy of $40 billion. That growth stayed steady through the tumultuous first quarter of 2018, with ad revenues still up 50 percent at $11.8 billion. 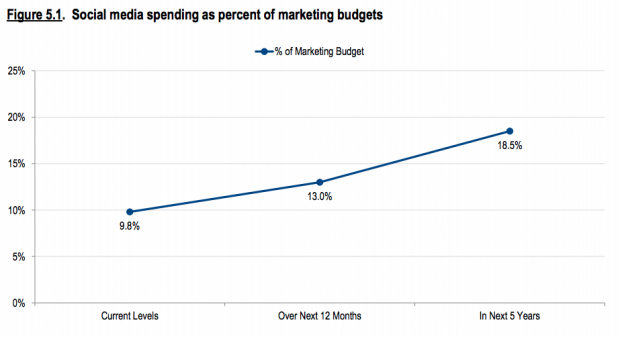 And remember that around 90 percent of those ads are mobile. According to Locowise’s State of Facebook Video report for 2017, the average length of a video post went from 0:55 minutes in 2016 to 3:48 in 2017. That’s a big jump, but Facebook said at F8 2018 that longer video isn’t necessarily a bad thing. Substantial, valuable content that people talk about and come back to will be prioritized by the algorithm. Facebook itself says that Facebook Live broadcasts have six times more interactions than typical video content. Twitter has 336 million monthly active users. Forty-six percent of American Twitter users access the site daily, with daily active usage increasing at 10 percent from 2017 to 2018. Accordingly, 52 percent of marketers are planning on increasing their Twitter video spend in 2018. 191 million daily users (a 15 percent increase from 2017 to 2018) spend more than 30 minutes per day on the platform, on average. Snapchat is the favorite platform of 45 percent of teens according to 2018’s Taking Stock With Teens survey. Compare that to Instagram, which rose two points to 26 percent. Meanwhile, Facebook declined slightly to eight percent and Twitter made a slight recovery to nine percent. Snapchat users watch 10 billion videos per day, on average (that’s four times what it was in 2017). A full 60 percent of users create content every day. LinkedIn has 562 million users, making it the world’s largest professional network. Fifty percent of Americans with a college degree use LinkedIn (compared to nine percent with a high school diploma or less). YouTube has a billion users (that’s a third of the internet). Ninety percent of 18- to 24-year-olds in the US, and 73 percent of Americans in general watch video on the platform. One billion hours of video every day, actually. YouTube reaches more American adults than any cable network in an average month. Half of YouTube’s billion hours of viewing every day are on mobile. The average mobile viewing session is more than 40 minutes. Just on mobile, more 18- to 14-year-olds in America are watching YouTube during prime time than are watching the top 10 prime-time shows combined. 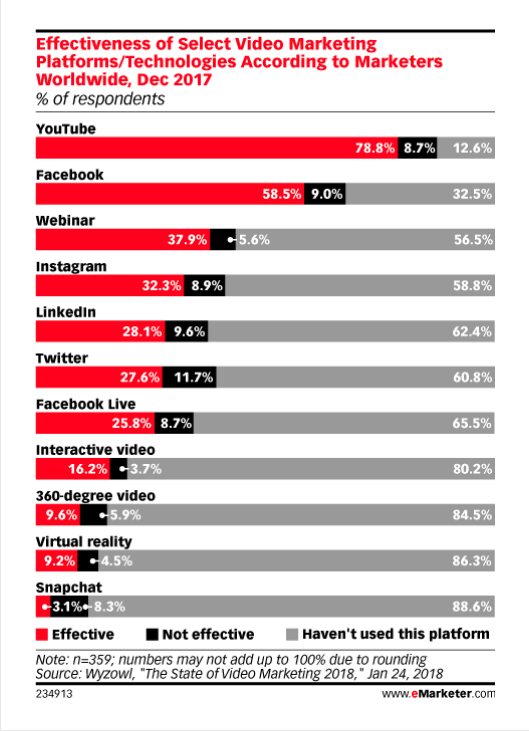 Eighty-two percent of B2C marketers versus 81 percent of B2B marketers value YouTube as an advertising platform. Meanwhile, twice as many small- and medium-sized businesses are advertising on YouTube in 2018 than they were in 2016 ago. Take Hootsuite Academy’s advance social advertising course and learn the tactics and best practices to create high-performing ad campaigns.